Let's get to know how to easily do what the Collab installer doesn't let you do easily: manage its individual components. At my current client, we're upgrading ALUI Collab 4.2 to 4.5 as part of our upgrade to ALUI 6.5. One feature of the new ALUI suite is that it offers a "common notification service" that replaces the collab-specific notification service that had been part of 4.2. Accordingly, we don't need the old Collab notification service. The official upgrade documentation says "If you have an existing Notification Service from your previous installation of Collaboration, disable or uninstall it." But how do you do that? If you run the Collab 4.2 or 4.5 uninstaller on a machine with more than one Collab component, it will remove every component. That doesn't work well since you're trying to upgrade the Collab piece and remove the notification piece. Similarly, you may realize that you installed Collab 4.5's Search Service on the Collab box when you really want it on the Search box, so how do you remove just the Search Service? In either case, you can use the batch file that is part of the undesired component, remove the service, then delete the files from the file system. In the case of the 4.2 notification, use this batch file: %ALUI_HOME%ptnotification\4.2\bin\ptnotificationserverd.bat, and in the case of the Search Service, use this batch file: %ALUI_HOME%searchservice\1.1\bin\searchservice.bat. Pass in the parameter "remove" and you're done. 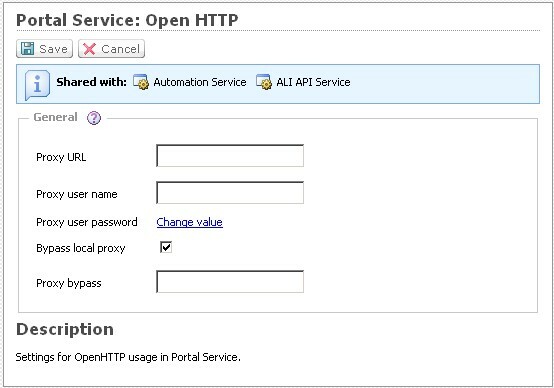 Are you familiar with the routine of opening the HTML source of an ALUI portal page, scrolling to the bottom, and checking for the name of the host server? This is something I've done countless times in load balanced environments when trying to test or debug a server. I decided to make a Firefox plugin that will extract that portal host information then display it at the bottom of the browser so that I can immediately see the portal host. I've had several other people try this plugin, and they found it useful. I hope you'll find it helpful too. To install it, download the plugin, then drag it onto your Firefox browser. It's been tested on FF versions 1.5 through 3.5. Thanks to Andreas Mersch who improved on my original extension. 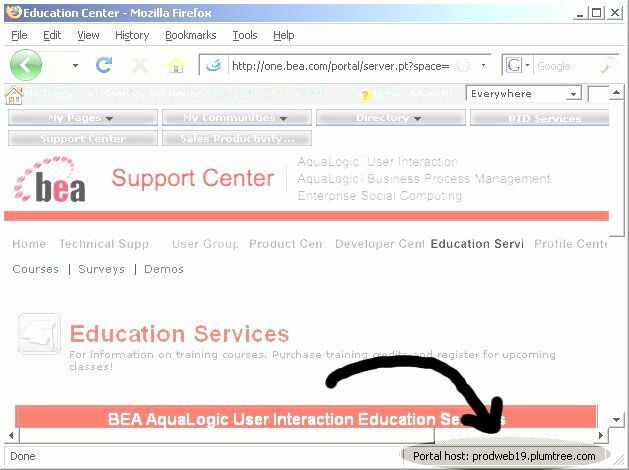 With his addition, the browser will now display the portal performance information along with the portal host. The new version can be downloaded with the same link as before. A colleague, Jeff, called today to ask about various performance-related items including ALUI portal caching. Many people know that portlet developers and administrators can coordinate to control caching of portlet content. This lets the company news portlet content, for example, be fetched once in an hour into memory and then be shared between all users, while the paycheck content is fetched for each individual user. Less well known though is that the system administrator can tune how the portal server handles the cache. How many of those paychecks for example should be stored in memory before being replaced? So Jeff and I chatted a bit about the options and effects of tuning portal server caching today. I was reminded of analysis I did at one customer which was interested in whether performance (on version 5.0.4) could be improved by using more of its spare portal server memory for caching. We found that it isn't worth the trouble to tune away from the default settings because the system works great out of the box. I believe the analysis applies to current versions as well. I'm not writing this as a blind fanboy who sees nothing but the brilliance of the ALUI product. Rather, after a careful analysis, I realized the tunings really are fine. You'll probably agree with me when you consider how the portal caching works. Basically, the portal stores content in its cache based on how recently used it is. 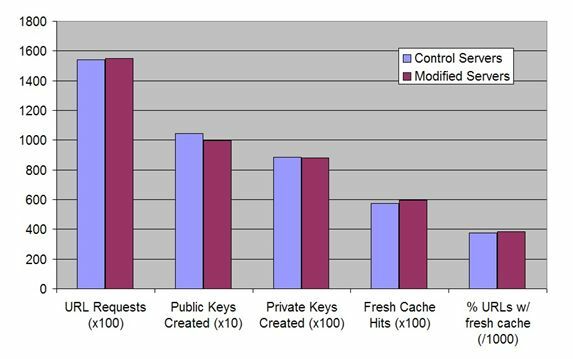 So the more frequently used content is, the more likely it is to regain its place on the top of the list of items to cache. When an item is infrequently used, it will be pushed down the cache list by other items and ultimately get pushed out. But this means that the most important content, the most frequently used, is always on the top of the list. All that content toward the bottom of the list doesn't get used frequently anyway, so who cares if it gets pushed out of cache? And if you triple the cache size, then you just store several times more unimportant content in cache. If you never knew the portal cache settings could be tuned, then forget you read this post because it doesn't matter. But if you were casting about on the Internet looking for information about this topic, stop while you're ahead! Don't bother fixing what isn't broken. It would be better for you to tinker with your image server's content expiration headers for something that will really have impact. Want data? Feel free to read the presentation I did on the results of my analysis. You'll see that when we tripled the cache size, we gained only insignificant reduction in requests to remote servers.